In my 'Django Unchained' review last month, I stated that every Cinephile goes through a stage of Tarantino fandom. I went through mine a few years back when I used to watch his films on repeat, but I am not the Tarantino fan that I used to be. Sure, I still love the guy and get excited for his films but I have just moved my fandom to the filmmakers that he emulates. While my passion for Tarantino cinema has declined slightly one thing has stayed constant, and that is my undying love for this film which is, in my opinion, his greatest film, 'Reservoir Dogs'. I decided to rewatch the film for about the 7 millionth time today, after playing its disappointing Video game. A group of six criminals are assembled to partake in a jewelery heist, but not all goes to plan as the simple robbery is crashed by the cops, as the remaining criminals are left to figure out who the police informant is. 'Reservoir Dogs' is the film that arguably revitalized modern Independent Cinema, with 'Dogs' Tarantino created one of the coolest films of the 90's and one that's sheer brilliance continues to shock and entertain audiences. From the terrific opening scene which shows a group of guys sitting around deconstructing Madonna's 'Like a Virgin' and the necessity of tipping, you are hooked and through his thought provoking and incredible Screenplay, Tarantino has you on edge through the entire duration. Tarantino is a great Director, there is no doubt about that, but he is a ten times better screenwriter in my opinion. He has yet to pen a script that I did not love. 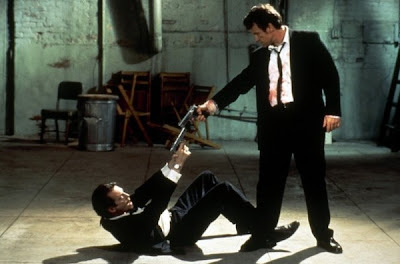 'Reservoir Dogs' make be perceived to be an action film but it is really the opposite of that, its a dialogue heavy character ensemble and that is one of the reasons I adore it so much. Honestly I am not the biggest Action guy in the world, I much prefer character based films, Hell I would take 'My Dinner with Andre' over 'Die Hard' any day of the week. 'Reservoir Dogs' is one of those rare films that can mix both elements perfectly, while its grounded in conversation between characters it does features moments of notorious violence which have been subject to ridicule from censor boards over the years. Tarantino treads the line perfectly though and never lets his film become to gore heavy and mindless. I always have to praise a film that can build tension and suspense through simple words, Tarantino does this incredibly with this film, the last half of the film is nail biting brilliance an unforgettable cinema. Tarantino's Direction is also brilliant as he includes plenty of little quirks that he has continued to use for his entire career, the glorious tracking shots, the musical irony and the unexpected juxtapositions, This has to be one of the best and most mature feature film debuts in recent history. The film features what has to be one of the coolest casts ever, Harvey Keitel plays Mr White and is as awesome as ever, as is Tim Roth as Mr Orange. Chris Penn is fantastic and one of my favorite Actors Steve Buscemi is phenomenal as Mr Pink whom has always been my favorite character in the film. My only nitpick from the cast is Michael Madsen as Mr Blonde, I know he is probably the most iconic character from the film and is part of the films most famous scene, but I just think that Madsen is a terrible actor who just tries way to hard to be cool and badass and he never pulls it off. Lawrence Tierney is good as Joe, Tarantino has a fun little appearance as Mr Brown and Eddie Bunker is pretty much a non entity as Mr Blue. I adore 'Reservoir Dogs' It is hands down my favorite film in Tarantino's great body of work and one of my favorites of all time. Terrifically written, brilliantly Directed and greatly acted, 'Reservoir Dogs' is the definition of Cool.